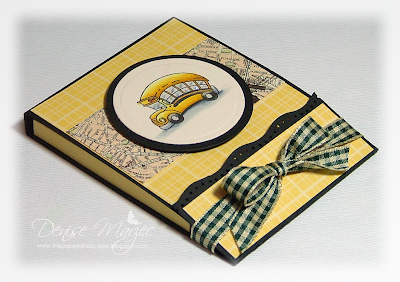 ....now to make a little somethin' for the bus driver. :) See ya! 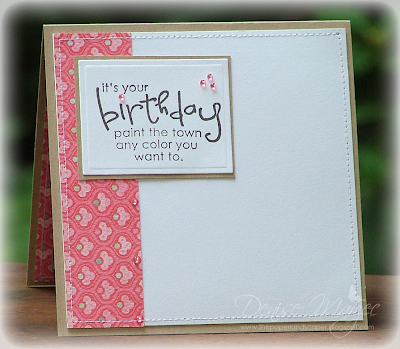 Bag Size: 5" x 11.25"
Hi stampers! Remember me?...lol! It's been a couple weeks since I've done any paper crafting or posted anything here to my blogaroo. 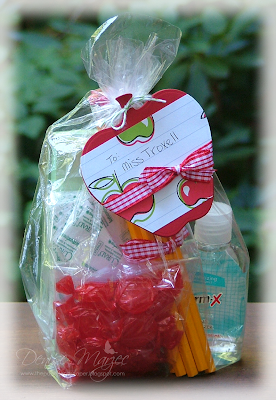 I've been busy with work, getting stuff ready for Kara's first day of school, spending time with friends while there's still some summer left, reading, and keeping up with my running. The main matted image is up on foam tape, all the edges are machine stitched, and I added a bunch of sparkle to Pineapple Girl (isn't she sweet? !...this is my first Mo Manning image...love it!) 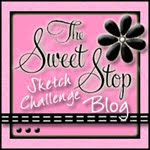 with my stardust Stickles (love that stuff, too!). Alrighty, that's it from me today. I need to go for a run this a.m. before it gets too hot. Hope you have an awesome Saturday! I found the recipe on allrecipes.com and it's specifically for CANNED peaches. My grandmother cans her own peaches every year (so yummy!) 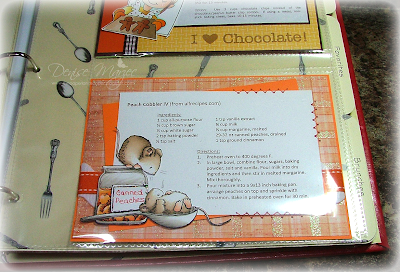 and gives them out to all of us in the family, so I was excited to find this recipe. I've made it a few times this summer already and it's been a hit so far.....it's an easy-peasy recipe, too! Gotta love that! 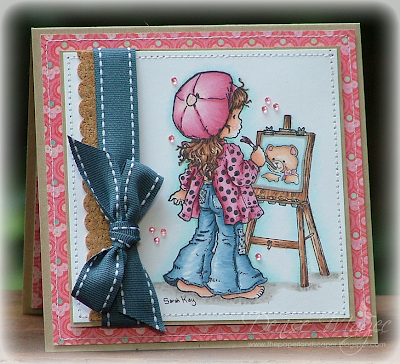 The stamp I used is a Penny Black stamp called Sweet Dreams. 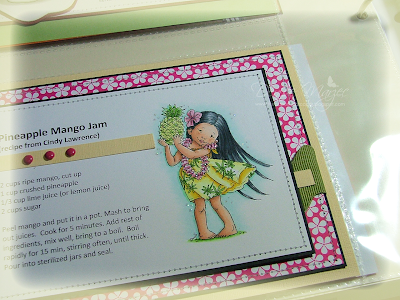 The stamp itself says "strawberry jam", but I changed it to peaches by coloring the fruit in shades of peach and orange, stamping a second label (by coloring the outline of the label right on the rubber stamp with a black SU marker), cutting that out, and gluing it over the original image. 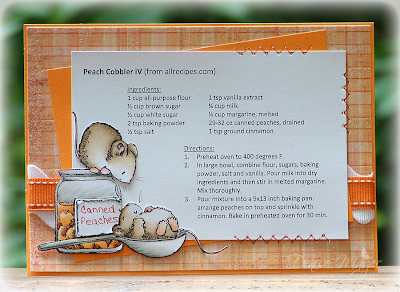 Then I just hand wrote "canned peaches"....viola!...done! 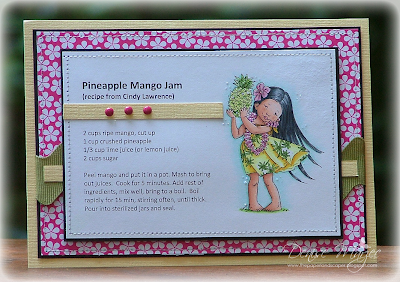 I faux stitched around the recipe and added some stardust Stickles to the "canned peaches" label. Okay, now enough laziness for me today. I'm gonna get myself dressed and take the dog for a walk or something. Enjoy your weekend! Whooo-hoooo! Productive day today! I got up early and went for a run with my friend Dawn, showered and went around to pick up work for the week, got reports typed up, AND made a card! Love productive days like this. ...thought the Penny Black sentiment went perfectly with the Sarah Kay stamp. Okay, that's it for me today. Have a great night! Okay, enough play time for me. I gotta get some work done.